‘Let there be throughout our kingdom a single measure for wine and a single measure for ale and a single measure for corn, namely the London quarter’. Having the Magna Carta connection with Beer Day Britain makes people appreciate that for centuries ale has played a central role in this country. The first thing that you will notice about the ale as when you receive it, is the way that it looks. Whilst not the most important feature of the drink, this is very important for your expectations of the other elements of the beer. Hold the glass and assess the appearance at eye level. There are three elements to the appearance of a beer; the colour, the clarity and its carbonation level (how fizzy it is). The colour for example may be ‘pale’, ‘golden’, ‘amber’, ‘ruby’, ‘brown’ or ‘black’. Generally the darker the beer is in colour the heavier the taste and texture of the drink. In clarity the beer may be ‘clear’, ‘hazy’, ‘cloudy’ or ‘turbid’. Cloudy beers are indicative of the beer having either an unfiltered finish. This is a trend that has become popular in London beers, or that the beer is of a wheat variety favoured on the continent. The carbonation level is fairly self-explanatory even for the novice lager drinker. Beers with higher carbonation levels can be described with words such as ‘spritely’ and ‘lively’. Those pints with less verve when it comes to fizz can be described as ‘lacklustre’ or ‘flat’. The next thing to slip its way into your senses, as you bring the drink to your parched lips, is the smell. A true expert will use three separate methods to truly smell the beer in a tactic known as olfaction. First, you should smell by breathing through your nose. Then through your nose with your mouth open, and finally with your mouth only. The smell of the beer is another way of getting a sense of the flavour and its notes before you actually taste. It is also more accurate and detailed information than what is afforded by the appearance alone. This is because you get a feel for the ingredients and notes that are swirling in the depths of the glass. Thus there are more elements for you to use to describe your beverage. The malts might contain sweet, roasty, smoky or even toasty aromas and may have nutty, chocolate, toffee, caramel notes within. The hops can be described as being dank, herbal, perfumy, spicy, grassy, floral or citrusy. The alcohol itself may also come through creating a heady boozy smell. Differing yeast varieties that brewers use also creates different smells. Ales for example have more fruity or flowery esters, along with spicy or peppery phenols. Lagers have a cleaner crisper clean note, allowing the malt and hop subtleties to have a greater role in what your nose picks up on. Finally we get to the most important part of the entire process. The way that the brew tastes and feels in your mouth. You might like to comment on whether the taste is reflected in the sights and smells you had picked up on previously. Or, whether the taste has some surprising elements that don’t come through in the aromas. Sip the beer and let it flow over your tongue to allow all the flavours to emerge. Very cold beer can mask some flavours, so allow the beer to warm up before coming to your conclusion. The feeling of the drink in your mouth is also an important feature here. The beer may feel crisp and light or chewy and heavy on your tongue in addition to the actual flavours that reside in the pint. The last thing that you should consider is your overall impressions of the beer. What was the experience like as whole? What was pleasurable or not so pleasurable? Perhaps even where you might improve the experience. Be honest and fair in your criticism and try and be as objective as possible to help the beer industry where you can. Remember its only beer. Thirsty for a proper taste of Britain? 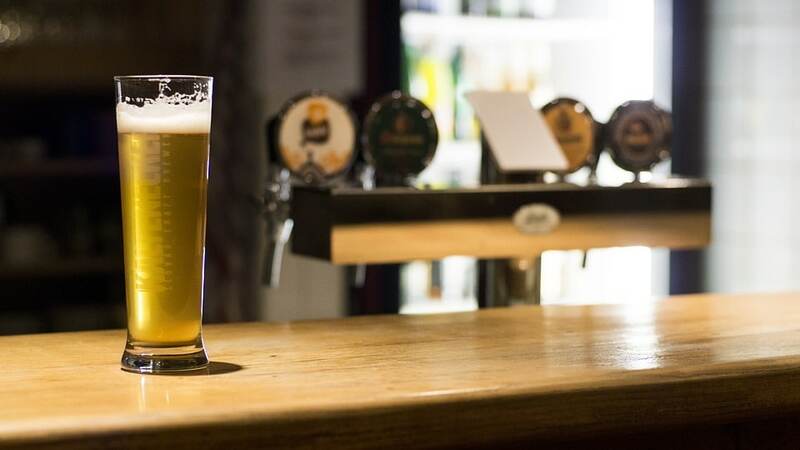 Head down to The Vicarage and The Courthouse in Cheshire to enjoy a selection of craft beers and traditional ales alongside something delicious from their menu this weekend – remember it is Fathers Day on Sunday – so an ideal chance to buy him a pint!